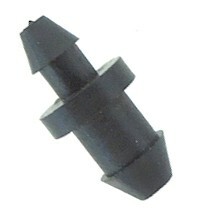 Use goof plugs can to plug holes in 1/2" poly tube, where you have pulled out a dripper or 1/4" barbed fitting. Use them to close the end of 1/4" micro tube or 1/4" soaker hose. Repairs small or larger holes with double end design.